The Hoverboard by ZR® is better than anything you’ll find at a lakeside amusement park, and Nashville FlyBoard’s got it! The Hoverboard® is like a surfboard, snowboard, and powered Wakeboard all in one, but even better! Once you hit the air on the Zapata Racing Hoverboard®, you won’t be able to get enough. The feeling is indescribable. It is surprisingly easy to get up on – easier if you have experience with board sports. The Hoverboard by ZR® uses the same hose connection as the FlyBoard®. Just twist off one and twist on the other. The latest version makes this extremely easy, so you get to spend more time in the water, or up in the air, than messing with your gear. “I highly recommend the FlyBoard® Hoverboard® combo. 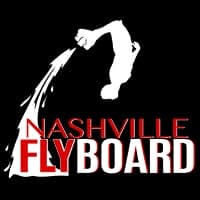 It’s a very different ride than the FlyBoard®, and just as much fun!” ~ Melissa, Owner, and Master FlyBoard® Instructor at Nashville FlyBoard. Hoverboard by ZR® for 1-2 people at Percy Priest Lake! Zapata Racing designed the FlyBoard® and Hoverboard® to work together with the same connection to the swivel tube and hose. Switch between the two in under a minute for an experience that is similar to the FlyBoard® in fun and excitement, yet a completely different ride. Instead of being propelled up, the Hoverboard by ZR® is propelled forward. The Zapata Racing Hoverboard® is like a powered Wake Board, Snowboard, or Surfboard all in one, but the thrill you get when you take flight on the Hoverboard by ZR®, ends all comparison to any other water sport or board sport. It’s a ride you won’t soon forget. The Propulsion from the PWC and the design of the ZR Hoverboard® allows you to surf on the water, or in the sky by simply lifting your lead foot.